Fig. (3) Activity of tagged L polymerases. (A) Relative activities of wild type, HA-, mCherry-, eGFP-tagged and N812Q and N812D mutant HA-tagged L polymerases in a series of minigenome rescue experiments. 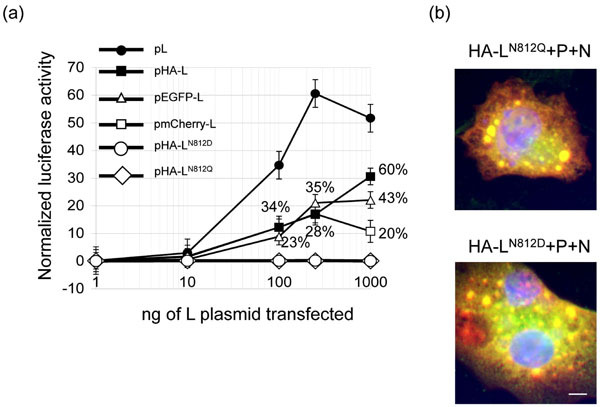 Various amounts of pL (filled circles), pHA-L (crosses), pmCherry-L (open squares), peGFP-L (open triangles), and pHA-LN812D (open circles) or pHA-LN812Q (filled diamonds) were used in minigenome transfection assays. Each luciferase minigenome activity value was normalized 24 h after transfection based on β-galactosidase expression and is the average of three independent experiments assayed in triplicate. The indicated percentages represent the relative activity of the structurally modified RdRp compared to the wild type control. Error bars denote standard deviations. (B) HA-LN812Q and HA-LN812D co-localize with inclusion bodies formed by P and N. BSRT7/5 cells were co-transfected with pP, pN and either pHA-LN812D or pHA-LN812Q, fixed and labeled with anti-P (red) and anti-HA (green) antibodies as described in the Fig. (1) legend.